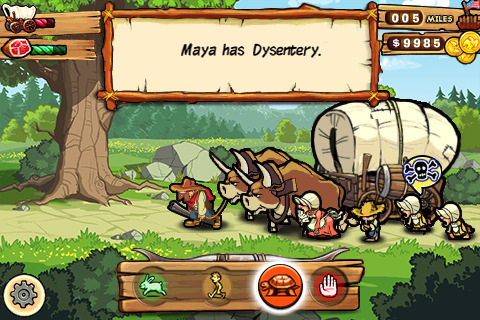 - All of the decision-making and problem-solving fun of the original game, plus additional parameters to take the Oregon Trail experience even further than you've played before. - 8 skill-based mini-games, including 2 accelerometer-based challenges: hunting, fishing, river crossing, rafting, wagon repairing, telegraph, berry picking, and gold panning. - Random events (disease, bandits, hitchhikers, etc.) faced by real pioneers increases the challenge. - Side-missions add more excitement to your journey, affecting your westward trek. - Prepare for your departure: Select the members of your party, choose your departure date and purchase supplies. To View Links You Have To Be Registered! !